Porch swings come in all different styles. Whether your home is rustic or traditional, a beachside cape cod, a farmhouse or a contemporary ranch house; if you have a porch, there is a swing to suit it. There are even modern style porch swings. 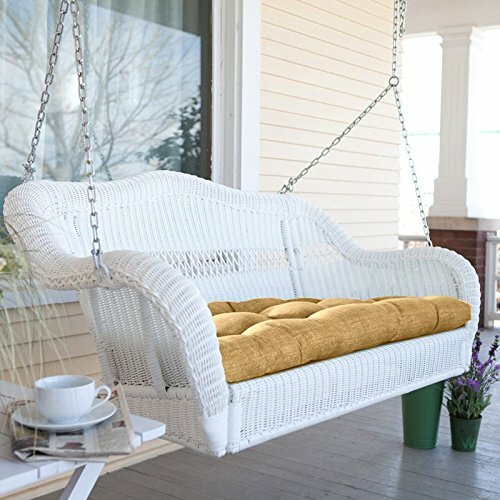 This porch swing has the look of traditional wicker made of resin at a very affordable price. It is smaller. More of a love seat size, at 43 inches. Before you pick out your swing, make sure it’s the right size for your space. First find where you have a beam on your porch to hang a swing from. Then measure where you want to hang the porch swing. Be sure to give some clearance for when the swing is in motion. 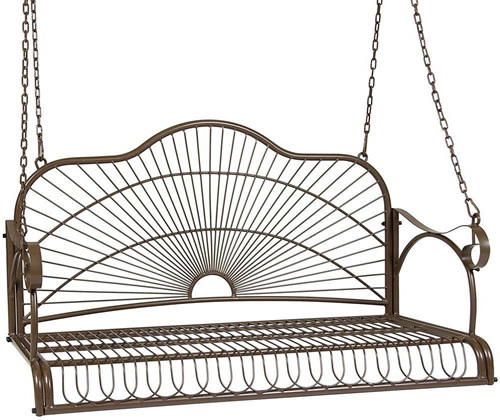 This metal porch swing has really great lines! It will fit even a smaller porch, at not quite four feet long. Porch swings come in various sizes. Smaller swings will fit anywhere, but a deep-seated design will really let you relax. Add some cushions for sofa-like comfort. If you personalize your swing with cushions, make sure they tie on securely. It is really not relaxing to be dumped on the floor. If you choose a wood porch swing, you can easily stain it to match or contrast with your porch. 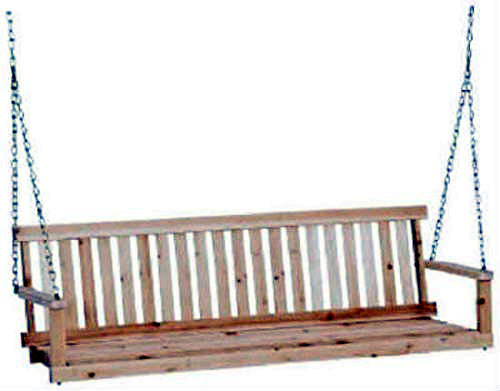 The very inexpensive Jack Post Porch Swing is 5-feet long and made of cypress wood. Personalize it with paint or stain. Then add a stencil! Add some fun color with a quick coat of spray paint or brush on a warm whitewash for a farmhouse look. Hanging my porch swing was really easy. There were already loops in the ceiling of the log cabin front porch when I bought it. There are plenty of instructions on the internet and I’ve never personally put up the hooks, so I’m not going to tell you how to hang a swing. I will suggest you make sure you don’t hang it too close to the wall or anything else. It’s not relaxing to constantly knock into anything. The porch swing above is going to hit the wall every time you move. 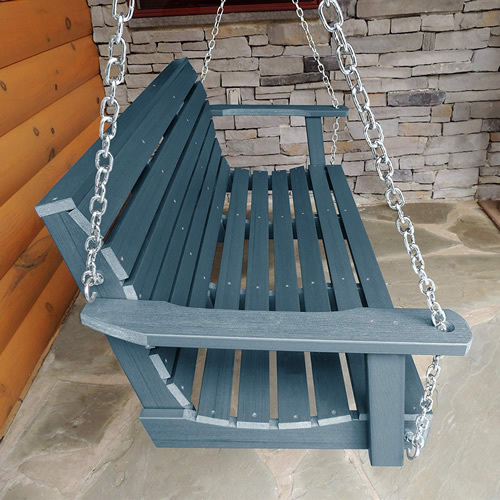 The Highwood Weatherly Porch Swing is available in 4 or 5 foot lengths. It is available in Black, White, Charleston Green, Coastal Teak, Nantucket Blue, Toffee, Weathered Acorn or Whitewashed stain. It looks like a traditional wood porch swing, but is actually made in the USA from recycled plastic. It has a 12-year residential Warranty. Then, make your swing truly yours with cushions and pillows. So, as this summer comes to an end and the evenings cool off, relax with a cozy throw on a porch swing and watch the sun set. This entry was posted on September 25, 2018, in Farmhouse, Porch Living and tagged beach, Blue and White, decorating, Outdoor Living, planning, porch, Rustic, traditional. Bookmark the permalink.